If only for the reason that you're being annoyingly irresponsible about it all- I want to take all your smartphones away. You try to rationalize a way through it. "I was into a game", "I was reading", "I was so absorbed by some new app", "I was mid text". When really you need to accept that you have a problem. That problem? You spent your hard earned money on a gadget that you have decided to focus on all the time which causes you to miss out on normal social cues and awareness. I have been witnessing (and potentially participating in) this behavior for a long time now. I observe the habit most clearly when I am on a streetcar or subway here in Toronto. People enter the transit, sit or stand, pull out their phone and completely ignore what is going on around them. Then it gets interesting. Elderly enter the same car or bus, obviously having a difficult time with their groceries and not a single person moves to assist or accommodate. Then there's me, a big, round, 8 months + pregnant woman. You can no longer mistake me for "maybe she's just a bit fat". My coat does not fit, my belly is huge, I waddle and as a result of said hugeness my balance is a tiny bit off making transit rides a bit more challenging. I am no fat drunk, I am a mom in the making. And no one ever offers me a seat. I watch other mothers in the making in my midst and no one ever offers them a seat either. We have to ask, which is fine but it is hard to get your attention when you are plugged in and ignoring us. Ignoring everything. It happened just a few weeks back. It was one of those things that I should have been mad at but felt was so absurd that I can only laugh at it. Laugh and then put it into a blog post with the hopes that someone will read it and share in my shock, laughter, whatever it is. So I come onto the subway at St. George Station two Thursdays ago, heading Eastbound about 8:30 at night and it is busy. Not rush hour busy but busy enough for me not to expect a seat. As I am standing there watching people I begin to watch the two women in the seats in front of me. One face first into her phone, refuses to look up and sense her surroundings. The other likewise, is into a hot game of Jewel Drop. When I raise my gaze to my reflection in the glass something odd strikes me about the woman next to me, she is having a difficult time standing. I am not surprised when I discover why. This woman, too polite to ask for a seat, has a full leg cast on and is standing with one arm on a crutch and the other holding on to the ceiling rail. Immediately I tap the Jewel Drop woman's phone and ask her to give the Leg Cast woman a seat. Jewel drop looks up a bit shocked and then surrenders her seat. I help Leg Cast into place and feel I've done my civic duty du jour. This incident left me wondering how it is that you can actually not notice at all when someone is having a difficult time with mobility. Even when I am reading I can notice from the corner of my eye a difference in pace of a person, or how much volume they have in groceries, body, herd of kids or other. A leg cast is a large and glaring thing to miss especially when paired with a crutch. How does another adult completely ignore this? I think as a way to tell this story short form and make people think a will try to work it into a joke.
" 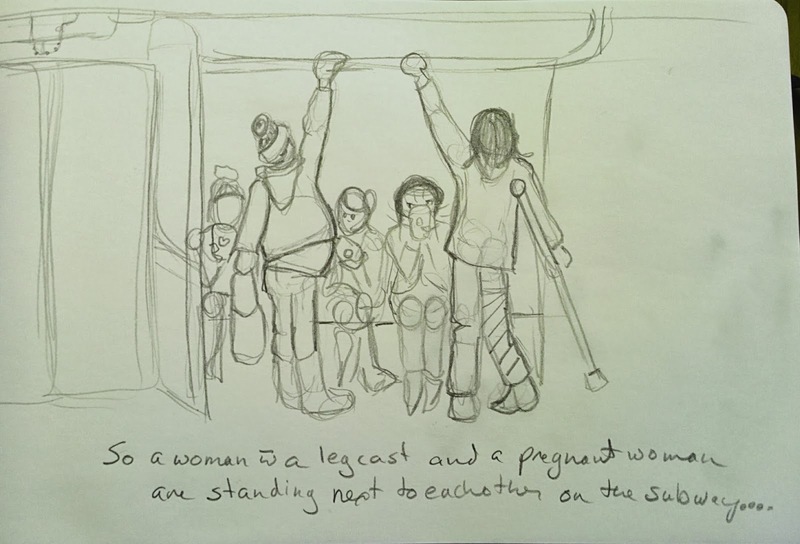 A very pregnant woman and a woman with a broken leg and crutch stand next to each other on the TTC."